Home toyota Next Generation Toyota Innova or is it just a major facelift? Next Generation Toyota Innova or is it just a major facelift? In our earlier post we had posted about the next generation Toyota Innova being tested on Bangalore roads amid heavy camouflage. 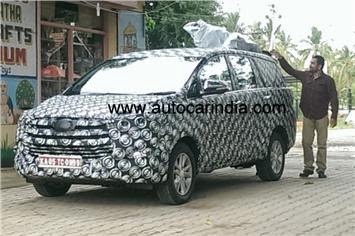 Carefully observing the spy pictures one might get doubt whether it is indeed the old Innova with heavy facelift in the front, rear and rear side profile. We too felt that the vehicle seen from the spy pictures is the same old Innova with heavy cosmetic changes. Note the similar dimension of the vehicle. If our guess is true, then we think Toyota is not aggressive in growing Indian market. Normally Toyota vehicle life cycle is 8 years and it’s the 9th year running for the Innova in India since its launch in 2005. If they are not planning to bring an all new replacement vehicle now, then when will they do? Probably the labour unrest at the Toyota factory in the outskirts of Bangalore might have changed the plans of Toyota for India, at least it might have affected the near future plans of the company. When the Qualis was stopped, Toyota received huge request for restarting the vehicle but the company ruled out to bring Qualis back saying it had completed its product life cycle. Since then Toyota has been seen as a renowned car manufacturer and customers thought of buying a Toyota with closed eyes. But Etios spoiled the party. Probably the company got carried away or country advisers mislead the parent company at Japan. Having burnt the finger once, it’s hard to understand why Toyota is still playing a safe game by giving a makeover to an old vehicle. Having said all these we wish our guess does not come true. Let’s wish to see an all new next generation Toyota Innova to carry on with the legacy of its predecessor.